There are lots of makes and models of boats with numerous features. How about a runabout? It’s a recreational powerboat, usually from 16 to 33 feet in length and priced around $38,000. It comes with a sterndrive or outboard motor, an open bow with seating, and a walk-through windshield. Do you want to ski and wakeboard? If your family loves watersports, you might look at an inboard tow boat. However, modern runabouts with sterndrive power can also be customized for water sports. Four Winns’ Surf Series is an example of how runabouts use the Volvo-Penta’s forward drive to get great wakes. Four Winns and Monterey both have a number of options like towers and ballast systems. Getting a good deal means comparing standard equipment with the cost for extras. Do you like to cruise or island hop for hours? Having a bimini top is important to get a break from the sun. Some boats include the bimini while others add the cost to get one. 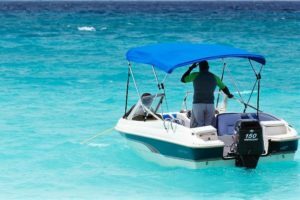 Rinker Boats are an example of runabouts that come with a bimini. Today there are more choices for a boat’s power and propulsion system. In addition to the MerCruiser or Volvo-Penta, new designs now maximize interior space. The Regal 29 OBX was one of the first models to use outboard power. It may not give you the torque you need if you start getting close to 30 feet. At that point, you might want to try twin engines. Finding the perfect runabout that meets your needs means visiting as many boat shows as you can stand. Pictures of boats won’t let you know how it feels to step aboard, feel and touch it.